Ah, eggplant. How I love thee. Your beautiful deep purple color, your hearty texture, your ability to please my picky eaters...*sigh*. What's not to love? Eggplant is one of the only non-meat foods that my husband will allow me to center a meal around. Which, if you've been following my blog, you know that he's a meat man, so vegetarian dishes that please him are hard to come by. I especially love this eggplant recipe because the eggplant is baked, not fried. Sure, I love the fried variety, but this also comes out crispy and delish without all of the effort and mess of frying. Not to mention that it's better for you. My method of turning the baked eggplant into eggplant parmesan might be a little different than you've tried in the past. I don't layer it in the pan and then cover it with the sauce then the cheese, I place the eggplant on top of the sauce then top with the cheese. This allows the eggplant to maintain some of its crispy texture, which I love. Then I serve it with a little extra sauce on the side for those who like it extra saucy! Give it a try! Spread the sliced eggplant in a single layer out onto paper towels. Generously salt the eggplant and let it sit for 15 minutes. Flip the eggplant, slat the other side and let sit for another 15 minutes. (This process will draw out the excess moisture and bitterness from the eggplant). Rince the eggplant with water and pat dry with clean paper towels. Combine the breadcrumbs, parmesan cheese and garlic powder in a shallow dish. Dip the eggplant slices in the egg and then the breadcrumb mixture, coating both sides of the eggplant. Drizzle a baking sheet (I use foil on mine) with olive oil and spread it around to cover the whole pan. Place the breaded eggplant in a single layer on the baking sheet. One eggplant should fit on one baking sheet, but if not, just use two baking sheets. Bake in the preheated oven for 10 minutes, flip the slices, then bake for an additional 10 minutes on the other side. Remove the eggplant from the pan. Cover the bottom of the pan with spaghetti sauce so the pan is completely covered, but not too thick with sauce. Return the eggplant to the pan (on top of the sauce). At this point, it is okay to layer the eggplant a bit to get it to all fit on one pan. If you choose to, you can also use a shallow baking dish instead of the baking sheet if you want to have a prettier presentation. Top the eggplant with the shredded mozzarella cheese. 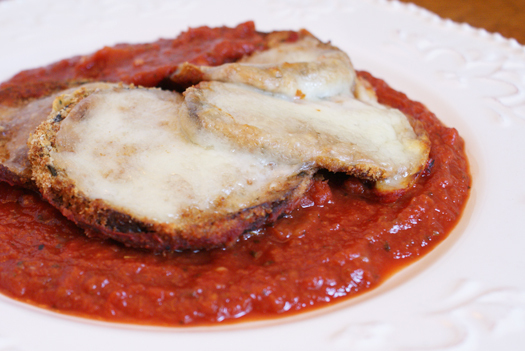 Bake the eggplant parmesan for an additional 30 minutes and serve with extra sauce on the side. I used a 12-inch cast iron skillet.